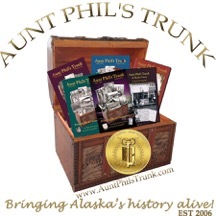 Discover Alaska’s Fascinating History with Aunt Phil’s Trunk! Alaska! With the popularity of TV shows like Deadliest Catch, Gold Rush, Alaska The Last Frontier, Life Below Zero, and many others over the past ten years or so, many people have become freshly inspired and amazed by the unique features of this wild and remote land. If your family is one that has caught Alaska fever, you will be delighted to know about a new book series called Aunt Phil’s Trunk. This amazing collection of stories started with the author’s beloved Aunt Phil, who was an award-winning Alaskan history enthusiast. Aunt Phil compiled much research about the history of this great state, and sometimes had stories about that history shared in various newspapers and magazines. 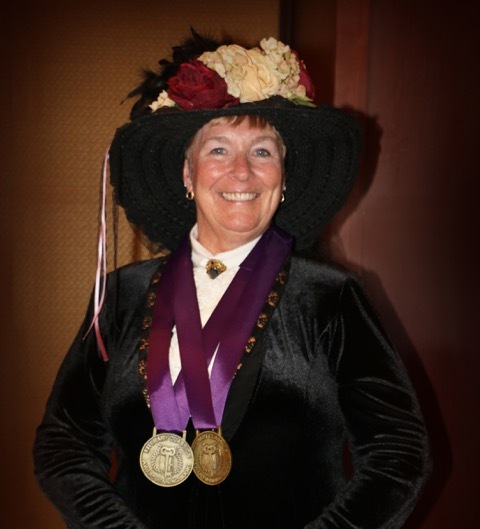 Upon her death, she bequeathed her life’s work to her niece, Laurel Downing Bill, who quickly realized what a treasure trove of history she had been entrusted with! Determined to share this information with others, Laurel earned a college degree in journalism and history in order to gain better skills as a storyteller, and set to work compiling these tales, and adding her own additional research to more fully represent Alaska’s story. The result of many years of relentless curiosity, determination, research, travel, hard work is a whopping five-volume collection of Aunt Phil’s Trunk. Each book covers a separate time period of Alaska’s history. The author was kind enough to send me copies of some of the books and sponsor this post so I could share more about them, and my impressions of it with you. Each volume is around 330 pages, and they are chock-full of interesting stories, with coordinating historical photos on almost every single two-page spread. The photos really help bring the history alive, and I’m amazed at the amount of research that went into sharing so many fascinating stories! Each chapter shares another intriguing story from Alaska’s history, and would be perfect for reading a bit each day with your children. You will undoubtedly learn about a wide variety of things, and find many jumping-off points that will spark your interests and imagination. Since we had all five volumes of the book here, I handed out one volume to each of my three high school sons, and my husband and I each had one as well. We enjoyed digging in to read about Alaskan history, and quickly learned so many new things that we had never heard before. From an island that changes size and location (!!) to panning for gold, getting to know more about early explorations and the indigenous Alaskan people and their ways, there are hundreds of intriguing pieces of information included in these books! As the tales from Aunt Phil’s Trunk gained in popularity, there was a rise in interest from those that wanted to use these books as a curriculum, since this is ideal for the study of Alaskan state study, as well as an additional perspective on American history in general. So they have now developed Student Workbooks and Teacher Guides to accompany each volume as well! The student workbooks are aimed at grades 4-12, and encourage a deep-dive into the study of each volume, with rich, layered activities. These include Discussion Questions and essay opportunities, Enrichment Activity suggestions, reading comprehension questions, map activities, and unit tests, and well as activities like word searches and crossword puzzles. For families that love to go off the beaten path, follow their curiosities and interests in learning, and find Alaska to be exciting and interesting, Aunt Phil’s Trunk is a uniquely wonderful collection! The author is extending a special offer to Enrichment Studies readers. You can purchase the Gold Nugget Special, which includes Volume 1 of Aunt Phil’s Trunk, along with the student workbook and teacher’s guide for $15 off the already discounted bundle price, PLUS enjoy FREE shipping! Use coupon code HOMESTEADER for your discount! Click here to check out this offer.